are thrilled about the challah! 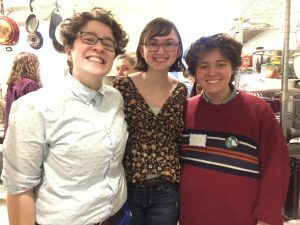 Hannah went on to acknowledge and applaud the resistance that Jewish-identified Smithies engage in on campus every day; they encouraged all students to attend the Labor Seder that SCJC is hosting in collaboration with the Jewish Labor Committee on April 7th. Another upcoming SCJC progam, in the CCTV lounge on April 20th at 8pm, is Sculpting Jewish Identity: Open Mic and Art Share! A number of SCJC students will be attending the annual J-Street conference in Washington D.C. in April. J-Street is a liberal advocacy group in communities and campuses across the United States, comprised of many young Jewish-identified activists; the conference will coincide with the organization’s 10th anniversary. Confirmed speakers include Former Associate Director of Public Engagement for the Obama Administration Matt Nosanchuk; Vermont Senator Bernie Sanders; and Non-Resident Fellow at the Foundation for Middle East Peace Peter Beinart. The organization’s mission statement reads: “J-Street organizes and mobilizes pro-Israel, pro-peace Americans who want Israel to be secure, democratic and the national home of the Jewish people.” Click here to read more about J-Street’s principles. 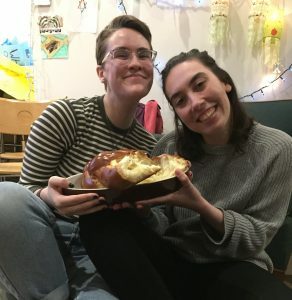 This entry was posted in Programs & Events, Student Articles, Student Orgs and tagged CRSL news, food, identity, Jewish, Passover, Shabbat, Smith College Jewish Community. Bookmark the permalink.